Item number 1188/68 from the MOA: University of British Columbia. 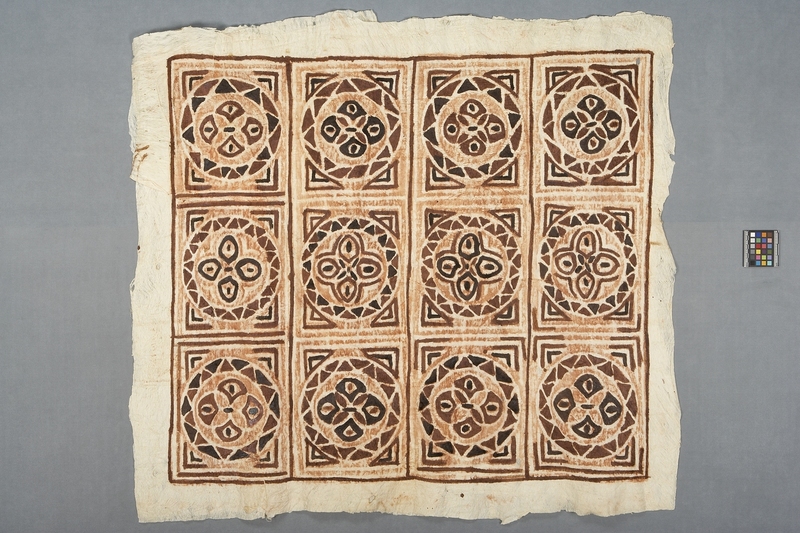 The cloth is square and natural coloured with designs painted in brown and black. There are twelve square blocks, three rows of four, with a circular design in the natural colour and brown. In each square the design shows four ovals pointing into the centre surrounded by a broken circle of triangles and framed by lines in each of the four corners. The same design differs from panel to panel in which aspects of the design are highlighted with black and dark brown paint. The cloth is made from three pieces attached together.